Post 7/8 – The purpose of the “One Suitcase” feature is to try to show you how you can pare down your packing list when you travel without sacrificing the number or variety of outfits you have for the range of activities your trip may entail. I have learned through trial and error (and the pain of lugging wayyy too big a suitcase) that by packing a few favorite & versatile pieces of clothing I can mix and match the items into a surprising number of outfit options. You just have to do a little planning up front. Hopefully the posts this week will show you my method and help you find the potential of the clothes you already have in your closet! FYI:You've got the bottoms mixed up in the first two (the description). By the way, I love your blog!! Having so much fun with all of your different looks! #26 and #27: bottoms are mixed up; #28: top is wrong. But I ditto Heather (above): love this blog and love pinning these. 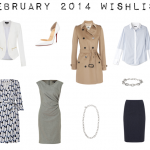 Any new outfit planning for 2014?